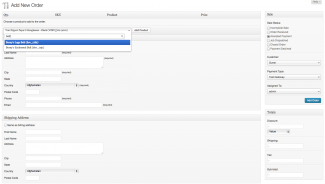 Manually process orders on behalf of the customer within WP e-Commerce. This solution allows store owners to process sales immediately where a customer prefers to call in/mail order and gets around the inconvenience of creating a new customer order through the Checkout page. Order and customer details are collected on the Store > Add Order page within the WordPress Administrator and is stored alongside standard online orders appearing in the Store > Sales page and dashboard widgets. Manual Ordering integrates with Offline Credit Card Processing allowing store owners to create new Sales through the WordPress Administration and attach credit card details to the Sale there and then. Manual Ordering now also integrates with the Members Access Plugin from GetShopped.org allowing store owners to process site memberships without leaving the WordPress Administration. The latest release can be downloaded from your My Account page. Looking for support, a copy of the readme, Plugin updates, Ideas or usage instructions? Check out our Documentation for Manual Ordering. Question and maybe a way to find the solution. (After my last post, I started wondering if there is a max number of products that can be listed before the plug-in no longer works.) My site has over 4,000 products. Based on the image (above) entitled ‘Creating a manual order from Store > Add Order’, it appears a product list is displayed. If the plug-in is installed on a site that has thousands of products won’t ‘too many’ products eventually overload the plug-in. On the most recent plug-in conflict form listing the problem (1st link below), I have asked the individuals how many products. If the plug-in can’t handle a larger store, wouldn’t a better solution be to manually add the SKU and then click a button to relieve the product info. Hi jfarns, can you please confirm if you’re using the latest 1.3.5 Plugin update, also I agree with your feature request. I’ve passed this feature onto my colleague to implement. Please note that the above screenshots are out of date and we now use an Ajax solution instead of listing all Products in previous releases, I’ll update them shortly so you have a better indication of the Plugin. We’ve moved to a jQuery engine to allow for far more Products to be supported. Pretty nifty’. The latest version (1.3.5) that was just released did not solve the problem. The previous version was removed and the new version was installed. The only thing that appears at the top of the Add Order page are the words “Add New Order”. Tried deactivating other plug-ins. The purchased plug-in does not work. Do you know when a solution/fix will be available? Do you know of any specific ‘other’ plug-ins that might cause a problem with the manual order plug-in? It is a little disheartening to purchase an expensive plug-in that doesn’t work. Sincerely in great need of a solution…. A fix would be very much appreciated. Thank you. Hi JF, very odd. There could be a Plugin conflict at play, if you could contact us from the Premium Support or Contact page we’d love to investigate this issue further and release a minor Plugin update to fix compatibility with your store. Thanks JF. G’Day Michael! I love the look of this plugin and I’m ready to hit purchase but need to know… is it possible to set/edit the price of individual products when creating a manual order? I notice from the screenshots that it doesn’t appear to be but hope they might be outdated. If not, will you consider coding this into the manual order form any time soon? Thanks dude. i’m just wondering if any users of this plugin could pass comment in lieu of Michael? I’m wondering if it is possible to set/edit the price of individual products when creating a manual order? We’ve got the website in question, http://drugtestsdirect.com.au up and running, but really need this functionality as soon as possible and hope this plugin will provide it. Thanks guys, any input is greatly appreciated. Hi Jools. 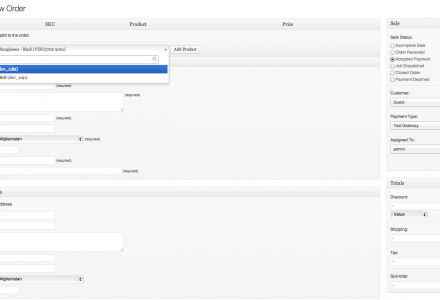 Yes, you can set individual product prices in an order using this plugin. Can this plugin be enabled for an ‘editor’ user (ie not an administrator)? I am also interrested in added access to a non administrator role. Thanks..
Hi Michael, having problems getting Manual ordering to work with Variations – am I doing something wrong or does Manual ordering not support that? Launching our bricks and mortar store on wednesday and was counting on this to work so would really appreciate if you could reply as soon as possible! Thank you! Hi Anders, variation support is not yet available for Manual Ordering. I have an AJAX expert working on this and other urgent features for the suite but cannot provide an ETA. I also have the same challenge. When i add an order i get “name, phone, adress, etc. is requied error message”, but i filled it. then the plugin succesfully send the personal informations, and the error messages dissapear. When i go to click on a user and click add order, is there a way to prepopulate all the billing details that they already have stored. i.e a repeat order from someone who has already puchased from my store, firstname, last name, email etc etc? when i click add order yeh, it defaults to their username but doesnt popualte anything else?? Hey Michael. That’s excellent news. Any ideas on how long this could take to build into it. I think the manual order plugin is fantastic but functionality like this could make it super useful bring much much more to the tool. Currently working with a client on this tool and it’s one of their biggest frustrations – I know it’s not so Hard to input in manually but seems silly if we already have all the info! almost forgot about this one. any progress on the update? superkeen to use it! Hey michael, did this get done? im looking at the notes for version 1.3.4 and it says..
“Validation remembers Checkout fields, cart contents and other Sale fields” but its not working for me..? Hi David, if you have filled in the Checkout fields/cart contents and a validation prompt is displayed (e.g. Disclaimer is a required field) then Manual Ordering will re-populate those fields. 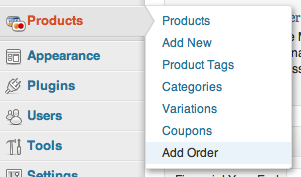 Please note auto-population of Checkout fields based on the User dropdown has not yet been introduced. 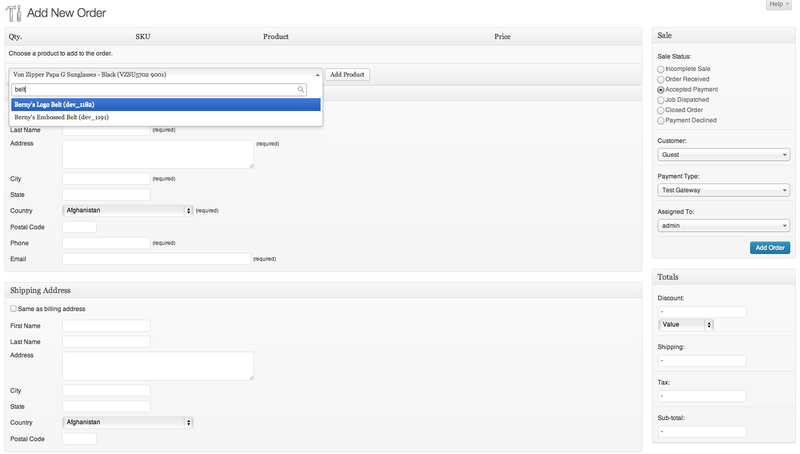 With the auto-population of checkout fields based on the user drop down, any luck on getting this up and running? Still super keen on having this feature because itll make our lives alot easier with manual reorders! Hi Anthrax-VX, that comment was referring to the earlier WP e-Commerce 3.7 compatible release, I’ve added this now in the latest Plugin update which is due for release later today which allows for the above (Sub-total, shipping and discount) and is compatible with the latest WP e-Commerce 3.8.
sounds great michael, cant wait to see how it works thanks so much. Hi Michael, just seeing how i can get the new plugin? thanks! Hi Anthrax-VX, you can download the latest Plugin update from the Premium Plugin Updates page. Since the last update, manual ordering of downloadable don’t work anymore. In the sense that the customer always see 0 download left in the account. I reverted to a older version to make sure. and indeed older versions works. Hi ThaPhlash, which version did you revert to? I’ll reproduce this and make sure it’s patched in today’s Plugin update. Hi ThaPlash, this has been sorted for 3.8.8 compatibility. In the 3.8.7.x release they reverted back to non-prefixed options for detecting the number of available downloads. This is now working again in 3.8.8 and moving forwards. Hi Michael, my question is similar to Matts. I’m about to open a physical store as a complement to my webstore. Will I be able to put my customers details in using the manual ordering plugin but make the actual transaction with cash or using iZettle (iZettle.com) for debit and credit cards? Can I create my own payment option in the system or do I always have to put in the buyers card details? Hi Anders, as below, you can accept payments as cash as Sales are assigned under the Manual Payment/Test Gateway payment option. I’ll be adding standard payment gateway support in a future Plugin update. Does this plugin allow store admins to process orders without having to provide payment/credit card details? Hi Matt, sure does. It uses the Manual Payment/Test Gateway payment option, I’m working to add support for standard payment gateways. Offline Credit Card Processing has been integrated with Manual Ordering. Anybody using a barcode scanner for inventory management? If so, can you tell me how you’re doing it. Thanks. Hi Tony C, until an integration solution links WP e-Commerce to POS I don’t see this being possible. I had planned development for this but due to Plugin commitments cannot look at this for quite some time. My top priority is the ability for customers to purchase on my website and for me to process their credit card offline. Second priority is for my intake department to take an order by phone and enter all the information and I personally process credit card information offline. I wanted to be sure this plugin offers both options seperately or together. Please let me know. Thank you for your time. I have two questions before I purchase this plugin. Does it handle variations and can you add shipping charges? Until the WP e-commerce international shipping is fixed, I have to manually create all international orders. Ability to create complete order, send invoice to customer and allow them to to pay all within the store would be awesome! Whoops – third question – can you go back in to the Manual Order and make changes? I am also looking at Edit Orders and Printable Invoices. With all the recent changes you have made, I’m not sure which plugin does exactly what and if I will need all three. Hi Tammy, just going over comments here for Plugins. Manual Ordering does not yet support variations, I can confirm that you will be able to adjust the sub-totals as well as discount and shipping charges in the next Plugin update. We’re about ready to sign a contract with client to develop a solution around Manual Ordering. But before buying your plugin we need to confirm first that an order placed through your plugin will deduct from the available stock for orders placed online. We have a physical retail store and a warehouse for shipping, that share the same inventory. Also we need to make sure the shipping option can be removed for retail orders and that cash can be used as a payment option. In addition to the first comment, we need to confirm that the order can be processed through the same Authorize.net gateway we use for online orders. Is there a way to edit existing orders using this plugin? This can be done with our Edit Orders Plugin that adds the ability to change the details of on order from within the WordPress Administration. Manual Ordering comes with a Quick Start document (readme.txt) to help with installing the Plugin. Additional support can be found from the Contact page or methods below. If you have any problems, questions or suggestions please join the members discussion on our Manual Ordering forum. As the end-user you’re driving this Plugin’s future. Vote for a feature enhancement and/or suggest features in the Comments section. If you have any problems, questions or suggestions please join the members discussion on my WP e-Commerce dedicated forum. This Plugin does not claim to be a PCI-compliant solution. It is not responsible for any harm or wrong doing this Plugin may cause. Users are fully responsible for their own use. This Plugin is to be used WITHOUT warranty.